I'm on a nostalgia kick at Slimy Wall recently, possibly because so many great older films are getting cable runs again. This week finds me looking back at this delightful gem from 1964 starring a triumvirate of terror veterans, plus Slimy Wall fave Basil Rathbone. Vincent Price, Peter Lorre and Boris Karloff teamed up a year after The Raven for this tale of an undertaker who sometimes finds it necessary to drum up his own business. 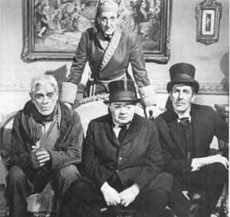 Of course, the plot in this case is a springboard for Price, Lorre, Karloff and Rathbone to have loads of fun playing off their images and with the genre in general. Throw in alcohol abuse, illicit romance, long-suffering wives and employees, in-law hate, catalepsy and that root of all evil, the love of money, and you have a winning combination of veteran actors at the top of their form and some delightfully wicked black humor. Although revealing the plot wouldn’t necessarily spoil the film as much as it does for other movies in the genre, there are still some very pleasant surprises to be had that are better viewed without advance notice. The script, by the brilliant Richard Matheson, is filled with wonderful dialogue and nimbly walks the fine line between black comedy and outright parody, the latter of which never really works with horror. The production values, courtesy of American International Pictures during its Roger Corman/Poe era, are top-notch; in fact, Comedy of Terrors fits so well into Corman's body of work for AIP that one has to double-check the credits to be certain he wasn't involved. High praise indeed. But the most fun is derived from watching these four old pros, ably abetted by supporting players recognizable to fans of spook movies, sending up their usual roles to great comic effect. The interplay between Price, Karloff and Lorre, established in The Raven, is embroidered upon here, and the sheer joy the actors obtained from playing such well-written characters in such a marvelous film is evident. The addition of Basil Rathbone, a formidable foil in any context, adds a layer not only of acting gravitas but split-second comedy timing that only increases the viewers' - and doubtless the actors' - delight. The Comedy of Terrors won't scare the pants off anyone; in fact, one is hard-pressed to imagine a soul so timid as to be even the slightest bit frightened by its action. But if you love the horror genre, and/or love watching great actors have a magnificent time delivering snappy dialogue and indulging in that rarest of animals, sophisticated physical comedy, then this 84-minute gem is right up your alley. And doubtless waiting at your local video emporium for you to whisk it home for an evening's lively entertainment.